On essential extensions, maximal essential extensions and iterated maximal essential extensions in radical theory (K.I. Beidar). A structure theorem for &OHgr;-groups (A. Buys). Quasi-division rings — some examples of quasiregular rings (H.L. Chick). Strongly hereditary strict radicals and quotient categories of commutative rings (B.J. Gardner). Radicals in Abelian groups (R. Göbel). Radicals of graded rings (E. Jespers). A general approach to the structure of radicals in some ring constructions (A.V. Kelarev). Closed ideals in non-unital Morita rings (S. Kyuno). Radical extensions (W.G. Leavitt). 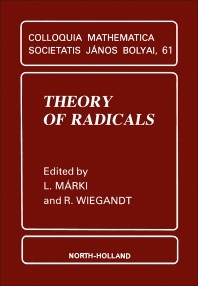 The distributive radical (R. Mazurek). Radical ideals of radically simple rings and their extensions (N.R. McConnell, T. Stokes). Classes of strongly semiprime rings (D.M. Olson, H.J. Le Roux, G.A.P. Heyman). Some questions concerning radicals of associative rings (E.R. Puczy&lstrok;owski). Some remarks about modularity of lattices of radicals of associative rings (E. Roszkowska). Some subidempotent radicals (A.D. Sands). The radical of locally compact alternative and Jordan rings (A.M. Slin'ko). On non-hypersolvable radicals of not necessarily associative rings (S. Tumurbat). To the abstract theory of radicals: a contribution from near-rings (S. Veldsman). Complementary radical classes of proper semifields (H.J. Weinert, R. Wiegandt). Radicals arose originally from structural investigations in rings, but later on they infiltrated into various branches of algebra, as well as into topology and relational structures. This volume is the result of a conference attended by mathematicians from all five continents and thus represents the current state of research in the area.